"Who says the time of revelations is in the past? 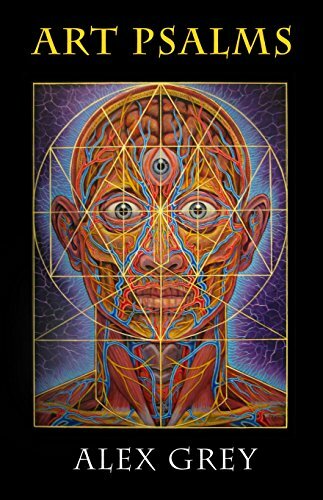 Alex Grey's Art Psalms and his life's work bear witness to the aliveness of Spirit in our dangerous and decisive times. Read and pray this book and grow your soul!" "Grey's vision of a flawed, but perfectible mankind stands as an antidote to the cynicism and spiritual malaise prevalent in much contemporary art." "Alex Grey is one of the great art-mystics of our time." "Whether a believer or non-believer, one could not help but be inspired by the sheer beauty of this volume, and the social heartbeat of this book.... The artwork is eye-grabbing, spirit-quickening, expressive-surrealism in a style uniquely Alex Grey's. Reminiscent of Leonardo Da Vinci's mastery, his anatomical plotting brings to mind mirrors of astronomical maps, connecting the body, mind and soul to the oneness of all, through synaptically charged points of light. The images pulse with light and life. Each tenderly rendered vision is accompanied by written timeless truths. One is serenaded and lifted by songs of the ages as told by Grey. The verses themselves seem to follow the illuminated body seamlessly, honoring humanity and the universe." The power of art as a transformative path is the theme of this inspiring collection from internationally known artist Alex Grey. Art Psalms combines poems, artwork, and "mystic rants" that fuse imagination, creativity, and spirituality. Grey’s oracular poetry declares that art, both its creation and its observation, can be a spiritual practice. Many of these writings have been shared at gatherings worldwide, especially at New York City’s Chapel of Sacred Mirrors (CoSM), a contemporary sacred space co-founded by Alex and Allyson Grey. Selections include "Soul Marriage," which invites the reader to commit to personal and global transformation; "Guidance for Servants of God," precepts for life as a sacred path; and "The Plan," which aligns universal and individual creativity. The entire text of Grey’s spoken word performance, "WorldSpirit," is included here. Three annotated portfolios, "Meditations on the Divine Feminine," "Meditations on the Masters," and "Meditations on Mortality," explore the connection between drawing and meditation as ways of seeing. Equally meaningful for art lovers, the health and spiritual communities, and anyone seeking to develop their creativity, Art Psalms features over 150 new reproductions of drawings, paintings, and sacred geometry to enrich and awaken the inner artist in each of us.